Vincent Phillip Muñoz, the Tocqueville Associate Professor of Religion and Public Life at the University of Notre Dame, has been named a winner of the 2011 American Political Science Association’s Hubert Morken Award for his book “God and the Founders: Madison, Washington, and Jefferson” (Cambridge University Press). Muñoz will receive this biennial prize for the best book in religion and politics at the association’s annual meeting in early September. He shares the award with Elizabeth Shakman Hurd, author of “The Politics of Secularism in International Relations” (Princeton University Press). 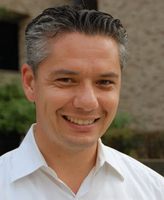 A specialist in constitutional law, American politics and political philosophy, Muñoz is a faculty member of the Department of Political Science in the College of Arts and Letters and of the Notre Dame Law School. “God and the Founders” is his first book. In “God and the Founders,” he analyzes the public documents, private writings and political actions of James Madison, George Washington and Thomas Jefferson to explain their competing philosophies of religious freedom and to show how each might have decided key Supreme Court cases. Muñoz is currently working on a sequel that will focus on how the American Constitution was designed to protect religious freedom. Articles from that project have already appeared in the Harvard Journal of Law and Public Policy and the University of Pennsylvania Journal of Constitutional Law. This fall, he teaches American Constitutional Law as well as Constitutionalism, Law and Politics—the gateway class to the University’s new undergraduate minor in constitutional studies. Originally published by Kate Cohorst at al.nd.edu on July 18, 2011.